The Aérospatiale SA342M1 Gazelle is the French army antitank version of the SA341 Gazelle, powered by an uprated Turbomeca Astazou XIVM turbine developing 650kW. The Aérospatiale SA341 Gazelle is a small single-turbine-engine utility helicopter that can accommodate up to two crew and three passengers. The Gazelle is operated on transport, scouting and light attack duties. Development of the SA-341 Gazelle started in 1966 under Sud-Aviation banner as project X 300 to meet a French army requirement for a light observation helicopter with seating for five people to replace the Alouette II. Soon afterwards, the name SA 340 was adopted for the project when Sud-Aviation began working on the light observation helicopter. While in the final design stages the SA 340 attracted British interest as a replacement of the Bell Sioux. This British interest led to a joint development and production share-out agreement signed on 22 February 1967 and officially confirmed on 2 April 1968. This share-out agreement was part of the franco-british agreement to licence production that also included the Puma and Lynx helicopters. The Sud-Aviation SA-341 is the production derivate of the SA-340, two prototypes of which have been tested. The first SA340 prototype c/n 340-01 had a traditional tail rotor and performed its first flight with test-registration F-WOFH on 7 April 1967. It was powered by a Turboméca Aztazou IIN turboshaft and equipped with a new semi-rigid rotor with composite blades developed in a cooperative effort with Bolköw. The second SA-340 prototype c/n 340-02 featured the 13-blade shrouded anti-torque rotor, the newly designed 'Fenestron' tail rotor instead of a conventional tail rotor, to be utilised by the SA-341, flew first with test-registration F-ZWRA on 17 April 1968. Four pre-production SA341s were built, with the first, c/n 314-01 test flown as F-ZWRH on 2 August 1968. The third pre-production SA341, c/n 341-03, was equipped to British Army requirements, assembled and tested in France, and then re-assembled by Westland Helicopters Ltd in the UK as the prototype Gazelle AH.1. As Gazelle AH.1 it was first flown at Yeovil as XW276 on 28 April 1970. As the SA341 Gazelle was interesting for both the military and civilian market, CofA was requested. On 7 June 1972, National Certification of the Model SA 341 G was given by the DGAC-F. On 27 April 1976, the more powerful Model SA 342 J was certified by DCAG. Over the years 1775 Gazelle helicopters were built in France by Sud Aviation / Aérospatiale / Eurocopter and under licence by Westland Helicopters Ltd. in the United Kingdom as the Westland Gazelle; by SOKO in Yugoslavia as the SOKO HO-42 and variants; and by the Arab British Helicopter Company (ABHCO) in Egypt as the ABHCO SA-342 Gazelle. On 1 January 1970, Sud-Aviation was merged with a number of other French aerospace companies to form the SNIAS (Société Nationale Industrielle Aérospatiale). From 1984, SNIAS operated under the name of Aérospatiale. The helicopter divisions of MBB from Germany and Aerospatiale from France merged in January 1992 to form the Eurocopter Group. As a result of the merger between the Eurocopter parents Aérospatiale-Matra; DaimlerChrysler Aerospace (DASA) and Construcciones Aeronàuticas Sociedad Anonima (CASA) in July 2000, the Eurocopter group became a division of the new formed EADS (European Aeronautic Defence and Space company). Taking off into 2014, EADS was rebranded as "Airbus Group". Uniting all its activities under a single brand, its helicopter division Eurocopter was rebranded as Airbus Helicopters on 8 January 2014. The ALAT - Aviation Légère de l’Armée de Terre 9 (the French Army Light Aviation) is the Army aviation service of the French Army. ALAT was established on 22 November 1954 for observation, reconnaissance, assault and supply duties. Three versions of the Gazelle helicopter were ordered for use with the ALAT. The SA342M equipped with HOT anti-tank missiles; the SA342L1 equipped with Mistral air-to-air-missiles and the SA341F is a general liaison helicopter, sometimes armed with a cannon. In service with the ALAT, the basic French army version was the SA 341F. Powered by an Astazou IIIC engine and armed with a 20mm cannon, it operates mostly in a light support role, though the Gazelle’s primary role within ALAT was as anti-tank gunships. The SA 342M, is armed with Euromissile HOT missiles. This anti-tank and reconnaissance version also carry the Viviane thermal imagery system. The Gazelle is being replaced in frontline duties by the Eurocopter Tiger, but is still used in a light transport and liaison role. The 1981-built Aérospatiale SA342M Gazelle c/n 1862 entered service as 3862 with ALAT (Aviation Légère de l'Armée de Terre) on 13 August 1981. SA342M Gazelle 3862 used over the years the codes CWA; CXC; CXH and CWH. In 2010, the helicopter was modified into a SA342M1 and was as SA341M1 operated first with 1e régiment d'hélicoptères combat (1 RHC) and coded GAL. 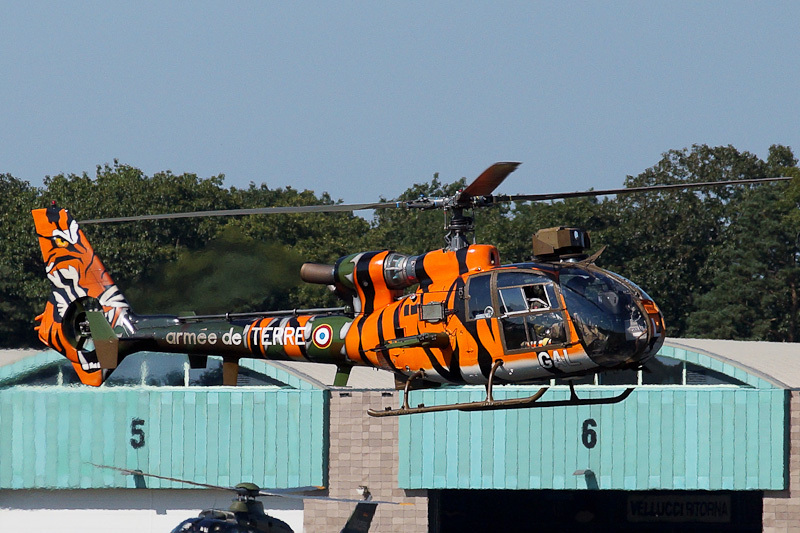 Today, SA342M1 Gazelle 3862 'GAL'is operated by 3e régiment d'hélicoptères combat (3 RHC) out of Étain. On 7 September 2016, SA342M1 Gazelle 3862 c/s F-MGAL was seen in its special NATO Tiger colors at Gilze-Rijen Air Force Base in the Netherlands during a spottersday organized by Gilze-Rijen Aviation Society (GRAS) and the Royal Netherlands Air Force Defence Helicopter Command (DHC).